Color Therapy is also known as syntonic phototherapy and optometric phototherapy. Science has shown that light entering the eyes is necessary for sight and also to regulate bodily functions through stimulation of one of the most important parts of the brain-the hypothalamus. The hypothalamus helps to maintain harmony in the body. Light goes into and through your eyes into the hypothalamus. The hypothalamus controls the autonomic nervous system (ANS). The ANS is composed of two opposing systems: the parasympathetic and the sympathetic. These two systems are responsible for stimulating smooth muscles tissues, the heart, and the glands. These systems work to create an equilibrium in the body. Think of a teeter-totter board with you standing in the middle. The parasympathetic on one side and the sympathetic on the other. In order to be healthy, these two systems must be in balance. The hypothalamus works with the endocrine system to control the mammary glands, kidneys, muscles, bones, thyroid, skin pigment, ovaries, testes, and the adrenal cortex. The parasympathetic rebuilds and rejuvenates your system. The sympathetic promotes actions and movement. The parasympathetic inhibits hormone production while the sympathetic stimulates hormone production. The parasympathetic relaxes you, your senses and your metabolism while the sympathetic stimulates you, your senses and your metabolism. Color therapy is a therapy that uses light to enhance the functioning of the hypothalamus and encourage balance through the hypothalamus's control of the ANS. Color therapy has been shown to have an effect on conditions ranging from jet lag and seasonal affective disorder to post traumatic stress conditions. 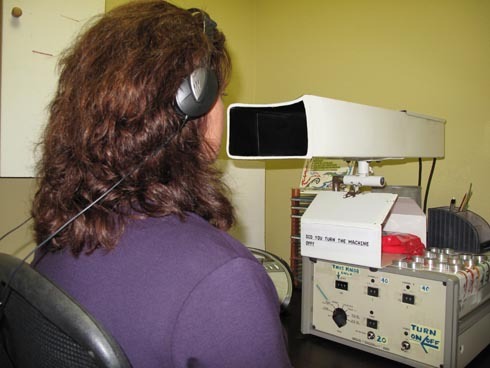 In order to determine the correct light frequencies to be stimulated, the therapist will conduct a color assessment test in the office during your first appointment. Everyone has different frequencies (or colors) of light that will be the most beneficial. The therapist will then determine the most beneficial blend of light that is individualized to each client. Based on the recommended blend of light, a treatment regimen will be instituted. The therapy will continue for 21 visits at 20 minutes each visit. At the end of the 21 visit cycle, the color assessment test will be given again to establish any continuing stimulation that should occur. Ninety-five percent of clients who complete the 21 visit cycle will need no additional visits. If additional visits are deemed necessary they will be supplied at no extra cost to the patient, until the therapist establishes that there are no longer any color imbalances.